He is not under the law as a curse and condemnation, but he is in it, and he delights to be in it as his rule of life; he delights, moreover, to meditate in it, to read it by day, and think upon it by night. He takes a text and carries it with him all day long; and in the night-watches, when sleep forsakes his eyelids, he museth upon the Word of God. In the day of his prosperity he sings psalms out of the Word of God, and in the night of his affliction he comforts himself with promises out of the same book. “The law of the Lord” is the daily bread of the true believer. And yet, in David's day, how small was the volume of inspiration, for they had scarcely anything save the first five books of Moses! How much more, then, should we prize the whole written Word which it is our privilege to have in all our houses! But, alas, what ill-treatment is given to this angel from heaven! We are not all Berean searchers of the Scriptures. How few among us can lay claim to the benediction of the text! Perhaps some of you can claim a sort of negative purity, because you do not walk in the way of the ungodly; but let me ask you - Is your delight in the law of God? 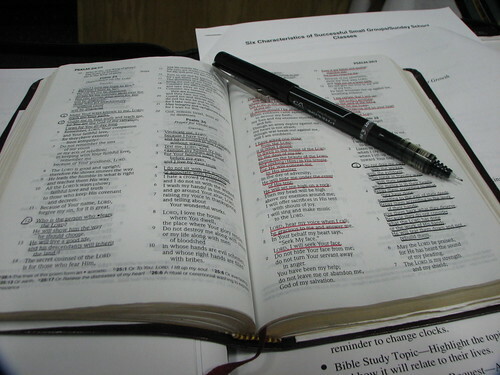 Do you study God's Word? Do you make it the man of your right hand - your best companion and hourly guide? If not, this blessing belongeth not to you. From The Treasury of David, exposition of Psalm 1:2. Image by George Bannister under Creative Commons License.